A 10-week public consultation has begun on plans for £1.5bn improvements to the A14 in Cambridgeshire. The scheme involves widening a heavily congested 25-mile (40 km) stretch in East Anglia carrying traffic from the port of Felixstowe to the Midlands. 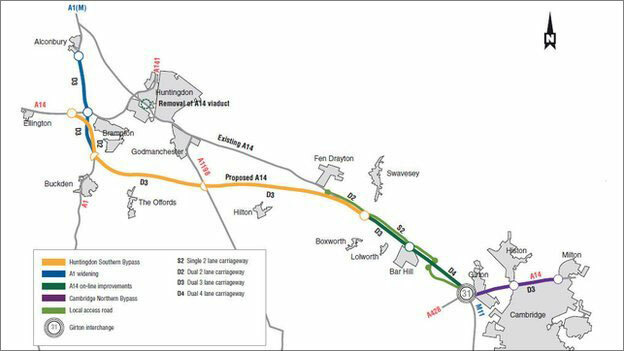 The Highways Agency proposals include a new bypass south of Huntingdon and the removal of a railway viaduct. The improvements are to be funded from general taxation after plans to finance it with a toll road were dropped. The agency said almost 85,000 vehicles used the A14 between Cambridge and Huntingdon, which it described as "significantly more than the level originally designed for". It added that about a quarter of the users were heavy good vehicles, which was "well above the national average". A previous plan to widen the A14, announced by the Labour government, was cancelled by the coalition government in 2010. In July 2012, it announced plans to improve the road, financed by the first toll scheme in the UK for a decade. But MPs from Suffolk and Norfolk described the scheme as "arbitrary and unfair" and the Road Haulage Association described it as a " a worrying precedent". The government decided the improvements should be funded by central government, local authorities and the Local Enterprise Partnership in December. If the proposals are approved, work should commence in 2016 and be completed by 2020.